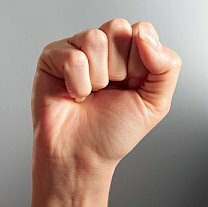 One thing I always think about when I eat, is that your stomach is as big as the volume of your fist! So when you serve yourself, the quantity you place in your plate should not exceed this volume. One trick is to always eat in a bowl that contains this volume. That’s a trick that I have learn when I read “L’art de la simplicite” (the art of simplicity) written by Dominique Loreau. This is a book I advice to everyone! She says that, even if you have never been slim in your life, you can! This entry was posted in Shoking news on Food, Uncategorized and tagged Size of stomach by babourc. Bookmark the permalink.